×Reservation for Cottage Holidayraj was succesfully sent. Facility owner will contact you by e-mail or phone. 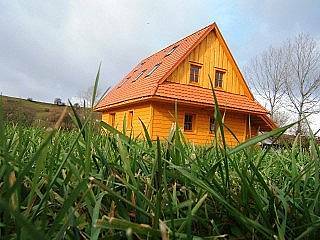 Comfortable cottage in Bešeňovej, Liptov Card for free. SPRING SKIING at great prices! 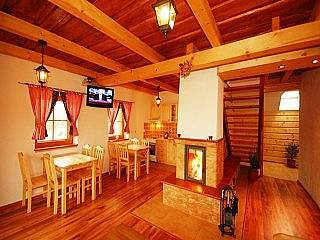 HolidayRaj consists of 4 cottages in a beautiful setting just 5 km from Gino Paradise Bešeňová. Cottages are very nicely and comfortably furnished, each room has its own bathroom. Discounts on ski passes in Jasna, water parks in up to 30%! SPRING SKIING at great prices! 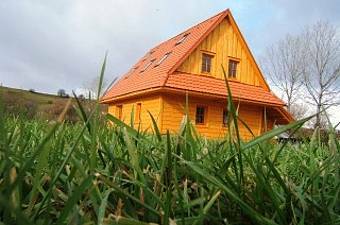 A cottage – 3 bedrooms with bathrooms (max. 11 persons), living room with fireplace, kitchen, terrace. Cottage B – 4 bedrooms with bathrooms (max. 12 persons), living room with fireplace, kitchen, terrace. Cottage C – 4 × 2-bed rooms, 2 bathroom with bath, living room with fireplace, kitchen, terrace. 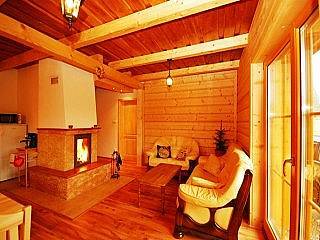 Cottage D – 6 rooms with bathroom and kitchenette, large living room with fireplace, kitchen, terrace. Chat D offer as a whole, or as a room. The total capacity of all cabins is 50 people. For large groups we also arrange meals. The cottage terrace, barbecue, garden swing, children’s pool, trampoline, sandpit, swing, children lift. The hotel serves a fireplace, rocking sietky and big land with grazing sheep. The cottage are possible beautiful walks in nature. Nearby attractions: 5 km Gino Paradise – water park 10 km Aqua Vital Lucky – spas, pools, spa 18 km Tatralandia 8 km natural Liptovská Mara 8 km Havránok – historical residence 14 km Magurka – old mining village 15 km Likavský castle 20 km Vlkolínec 10 km Prosiecka valley 10 km Kvačianska Valley High and Low Tatras The living room you can sit on comfortable leather sofas, watch TV, or a small fire in the fireplace. In summer you can grill, swing on the swing, children bathe in an inflatable pool. 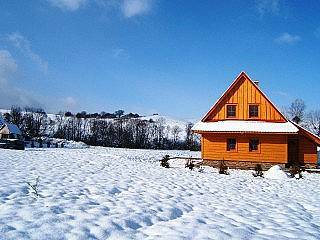 Spend a lot of fun in the thermal park or western town, embark on an amazing walk in Liptov valleys, or just watch the sunset from the terrace at the cottage HolidayRaj. Energy costs are paid separately.